The historic hangars 3, 4, and 5 with a modern facade of offices and shop. Hangar 2: The Grahame-White Factory and Offices in 2013. Hangar 2: The Grahame-White Factory and Offices in 2019. 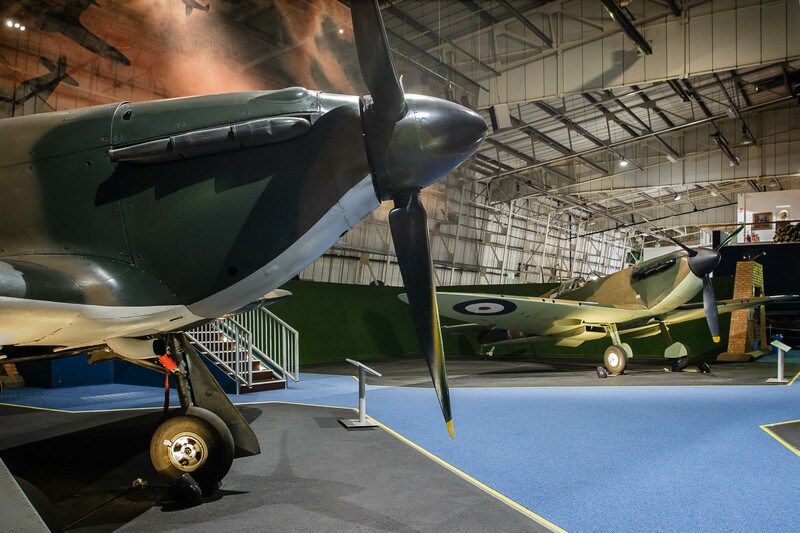 The Museum at Hendon is situated on the site of an historic Royal Air Force airfield that dates back to the World War One and is comprised of four main buildings which are open to the public. One building the Claude Grahame-White Factory was dismantled and moved to the Museum site and completely restored. 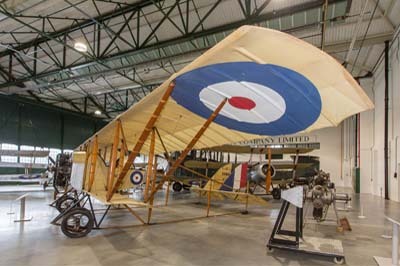 The Bomber Command Collection and the Historic Hangars Collection can be found in hangars that date back to World War One. 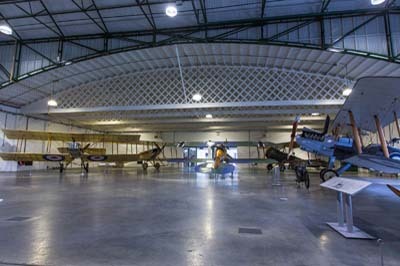 The Milestones of Flight Exhibition (Hangar 6) and the former Battle of Britain Collection (Hangar 1) are housed in very modern buildings that unfortunately lack the character of the older historic buildings. 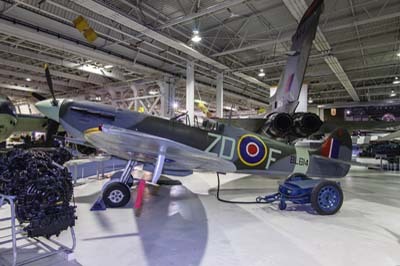 The Royal Air Force Museum at Hendon was opened by the Queen on November 15, 1972 with initially just 36 aircraft on display. I noted around 100 aircraft during my visit in January 2007. 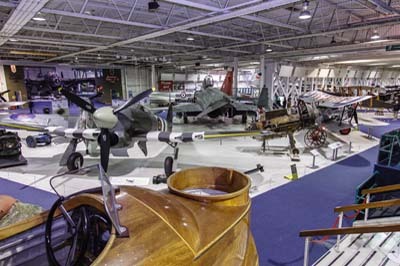 There are reserve collections at RAF Cosford, which is also open to the public and also at various other locations around the UK, which are not. What I like about the aircraft on display is that they nearly all appear to have some direct connection with the RAF or Great Britain. 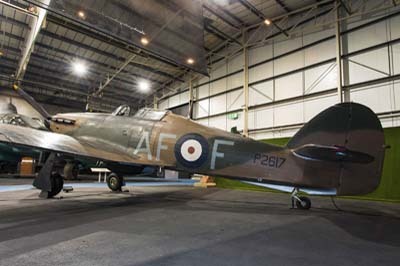 The aircraft either served in or with the RAF or fought against the RAF in two World Wars. The collection of captured German aircraft from World War II is surely the best in the world, more cab been seen at RAFM Cosford. The development of flight is covered from its start to the latest fast jets. A prototype Eurofighter Typhoon were found hanging from the roof next to a Blériot. 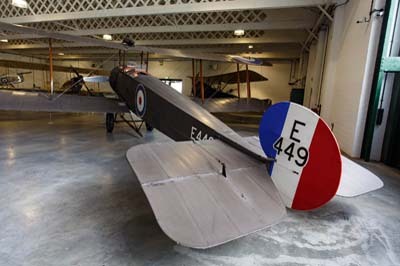 Around half dozen replica aircraft are on display where original aircraft are not readily available. The replicas don't impress me that much and so I have chosen not to feature them here. 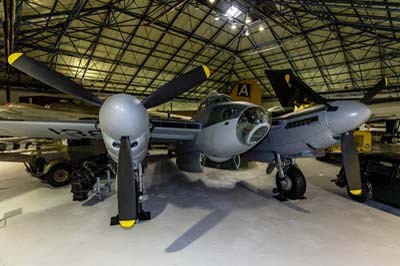 Some of the aircraft are presented very well with wartime scenery and artifacts. The aircraft information boards are excellent, I particularly liked the aircraft histories, taking you from an aircraft's first squadron and on to how and when it ended up in the care of the RAF Museum. 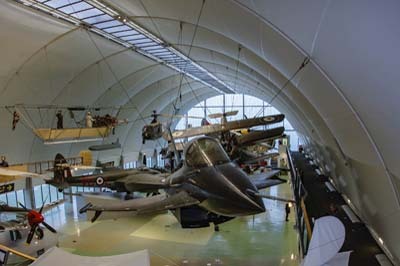 Hangar 6: held the Milestones of Flight Exhibition with the more recent arrival in the foreground, a Eurofighter Typhoon prototype, photographed in 2008. 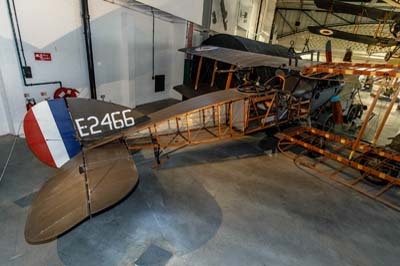 Blériot XI ('164' also BAPC106 and 9209M). Designed by the French aviator Louis Blériot in 1909. 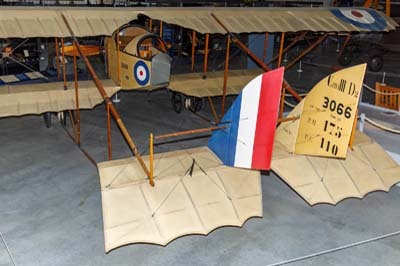 The French, British and Italian air forces took delivery of 132 Blériot XI's from 1910. 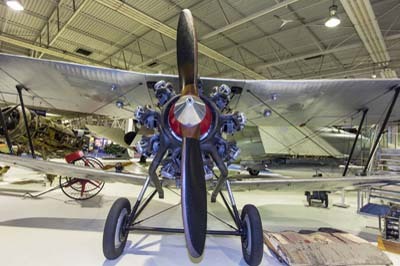 It is on display at the Milestones of Flight Exhibition. Blériot XXVII (unmarked and c/n 433 later BAPC107 and 9202M). 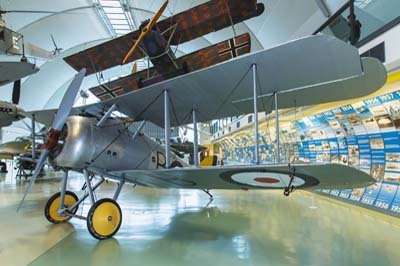 The aircraft on display first flew in September 1911. In 1914 it went into store at LeHarve before being discovered by Richard Nash in 1936 and taken to Weybridge. 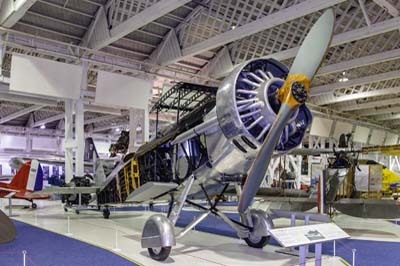 Following a crash and rebuild the Blériot was loaned to the Science Museum in London in June 1939. 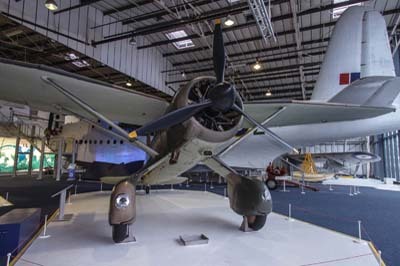 Following a period of storage it was put on display at Farnborough in 1950. 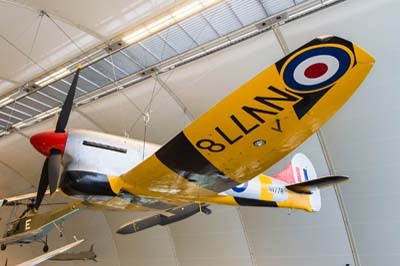 In 1953 the Royal Aeronautical Society bought it from the Nash Collection. It was moved to Upavon in 1962 for the 50th Anniversary of Flight Exhibition. In 1963 it was restored at Lyneham and then delivered to the RAF Museum store at Henlow in 1964. Further restoration took place at Cardington in 1974. 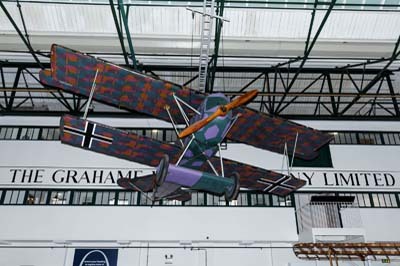 In November 2004 it was transferred to Hendon for display and later moved to the Grahame-White Factory in January 2004. Avro 504K ('E449' and 9205M). The Avro 504K was a primary two-seat trainer with a top speed of 85 mph (137 kmh). Over 10,000 were built from 1913 to 1932 when production ended. 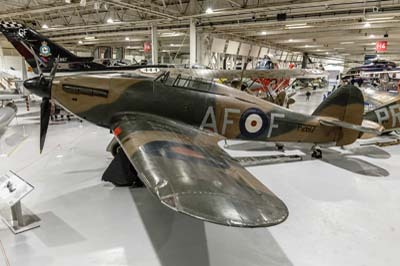 The aircraft on display is a composite aircraft assembled using the wings of an Avro 548A (E499 and G-EBKN) and the fuselage of an Avro 504K (G-EBJE). 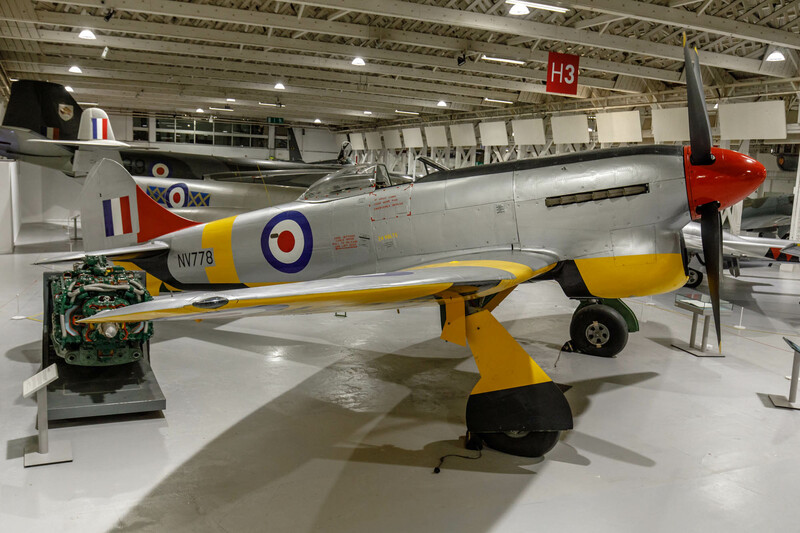 Another aircraft from the Nash Collection, it was put together in the 1950s when in the charge of the Royal Aeronautical Society, by engineers of British European Airways. It was later restored using another engine at RAF Abingdon to flying status, taking to the air on June 24, 1966. It was further restored and repainted at Henlow before it moving to Hendon in 1972. 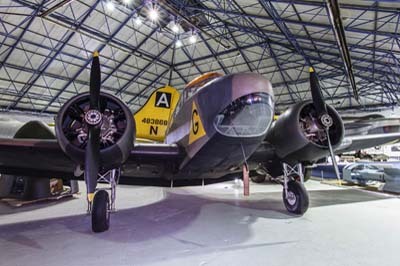 Along with other aircraft in the Nash Collection it was bought by the Museum in 1992. Caudron G.III (ex O-BELA, OO-ELA and 9203M painted as '3066'). The Caudron G.III was designed by Gaston and Rene Caudron and was in production from May 1914 as a two-seat reconnaissance trainer. It had a maximum speed of 65mph (105 kmh). This particular example was built in 1916, nothing is else is known about its identity and service history. By 1921 it was registered in Belgium as O-BELA but changed to OO-ELA in 1929. After appearing at the RAF Display at Hendon in June 1936 it was acquired by the Nash Collection and allocated G-AETA. The Royal Aeronautical Society bought the aircraft in 1953, handing it to the RAF in 1964. It was moved to Henlow and rebuilt as '(N)3066' of the RNAS Flying school at Vendôme in 1917. 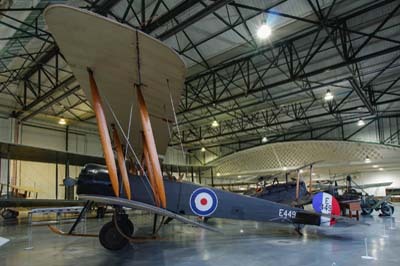 It moved to Hendon in 1972 and is now on display in the Grahame-White Factory hangar. 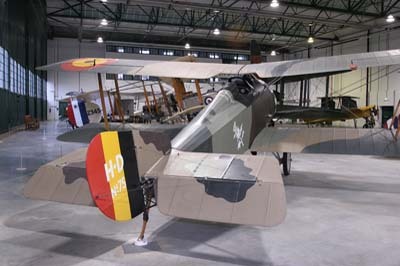 Hanriot HD.1 (HD-75 of Belgian Air Force later G-AFDX and OO-APJ). The Hanriot-Dupont HD.1 was designed by Pierre Dupont and built at the Hanriot factory at Billancourt in France from 1916. At least 79 HD.1s were delivered to Belgium from 1917 (serials HD-1 to HD-79). 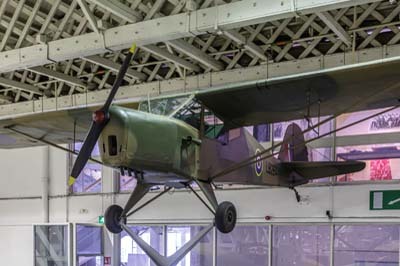 (HD-78 is at the Brussels Museum). 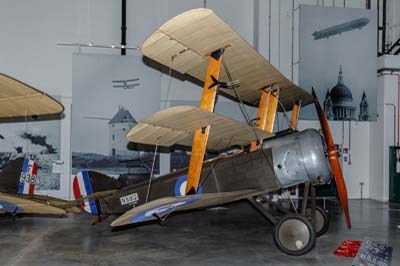 This aircraft served in the Belgian Air Force from 1918 at Les Moores and Nivelles. In 1922 it won the World Aerobatic Championships at Nice and was eventually withdrawn from service in 1933 and put up for sale. 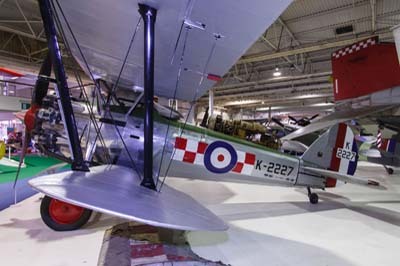 In 1937 it was purchased by Richard Shuttleworth and flown from Evere, Brussels to Old Warden and registered as G-AFDX. Following a landing accident in 1939 it was put into store at Old Warden and later Brooklands, where the wings were damaged beyond repair in a German bombing raid. In 1962 it was sold to Marvin Hand in San Francisco where he restored the aircraft. 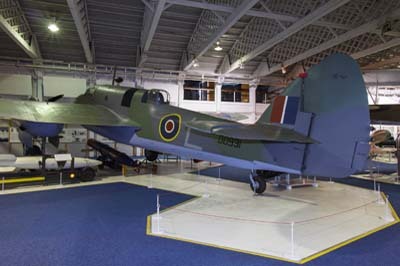 He presented the aircraft to the RAF Museum in 1978. 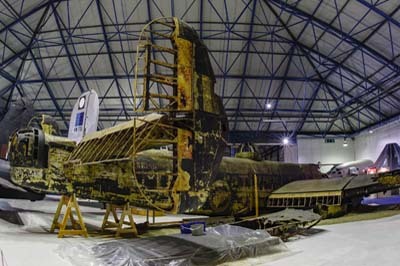 After further restoration at Cardington it was moved to the Museum in 1979. Sopwith Pup (N5182 later 9213M). 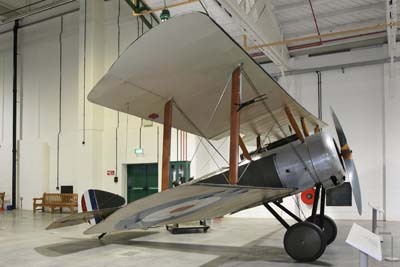 The Pup was in service between 1916 and 1918 as a single-seat scout-fighter, it had a top speed of 111 mph (179 kmh). 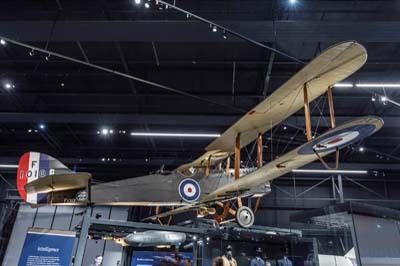 The aircraft on display was built by the Sopwith Aviation Company at Kingston-upon-Thames, it was delivered to 8 (Naval) Squadron in September 1916. The Royal Naval Air Service squadron was then operating from Dunkirk before moving to Vert Galand. By the end of the year pilots flying N5182 were credited with three victories. In 1917 N5182 was transferred to 3 (Naval) Squadron before it was withdrawn from service in August 1917. 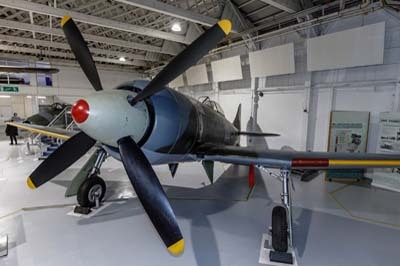 By around 1960 she was found in the Musée de l'Air's reserve collection store and was moved to the United Kingdom for restoration. Thirteen years later and fully restored to flying condition it suffered a force landing on a delivery flight to Blackbushe in 1974. 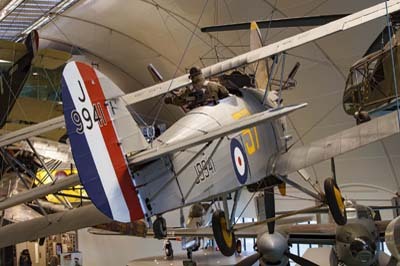 By 1982 the RAF Museum had acquired the aircraft for display. 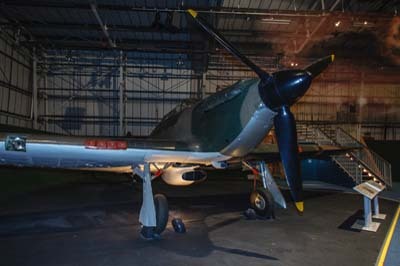 On display at Cosford by 2017. Sopwith Camel F.1 (F6314 later 9206M). 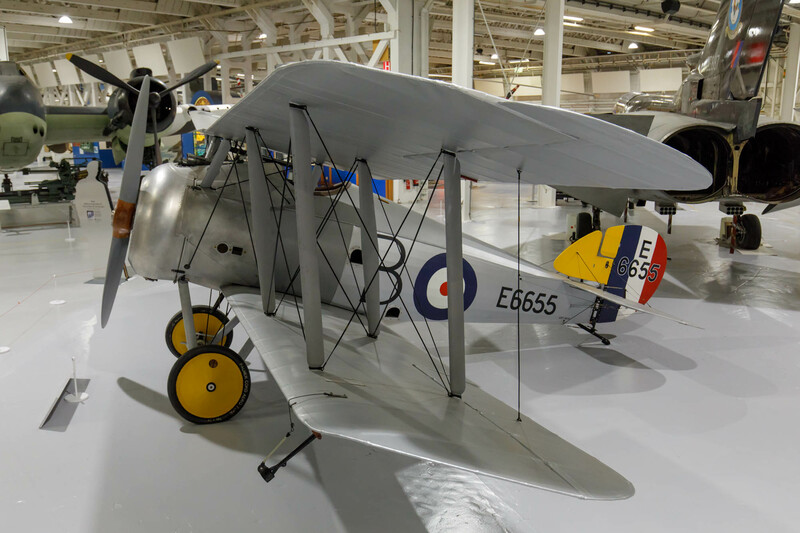 Developed from the Sopwith Pup, it was the most successful aircraft of World War I. 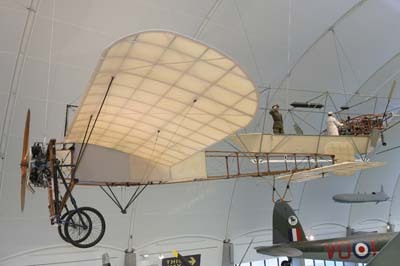 It's name was derived from a slight hump forward of the cockpit. 5,490 Pups were produced from 1916, they claimed more kills (1,294) of German aircraft than any other allied fighter. 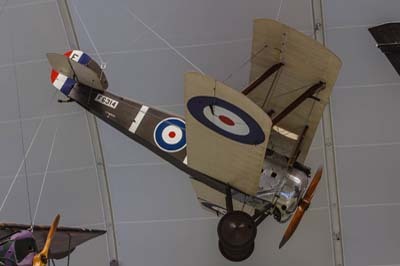 Eleven companies apart from Sopwith Aviation Company built the Camel, including Fairey Aviation. It was found to be a difficult aircraft to fly due to its rotary engine that generated torque, which unless full right rudder was used on take off, caused inexperienced pilots to ground loop. During World War I, 413 Sopwith Camel pilots died in action with 385 pilots being killed due to accidents. F6314 was manufactured by Boulton and Paul. 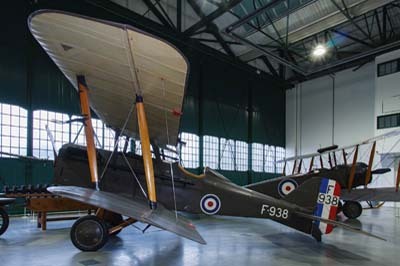 Royal Aircraft Factory SE.5A (F938 and 9208M formally G-EBIC). 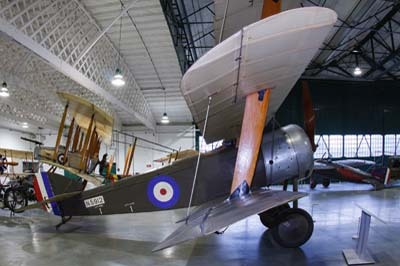 The RAF SE.5A was in production between 1917 and 1920 as a single seat fighter. It had a top speed of 120 mph (193 kmh). 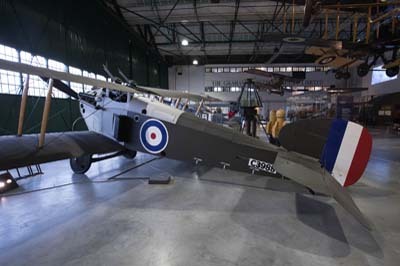 The aircraft on display was built by Wolesey Motors of Birmingham in 1918. After a period of storage it was registered as G-EBIC in 1923 and moved to Hendon for skywriting operations by Major John Clifford `Jack' Savage and his Savage Skywriting Co Ltd based at Hendon from 1922 until 1934. 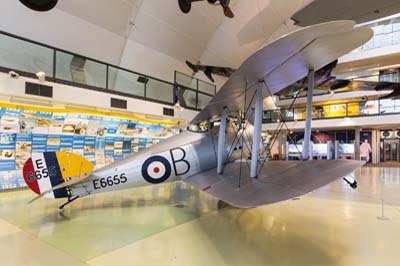 Another example G-EBIB is on display at the Science Museum in London. By 1930 it had been acquired by Richard Nash and was put on display at the Royal Tournament in 1938. Throughout the 1950s it was displayed at various events. In 1968 it was completely overhauled at the RAF Museum workshops at Henlow. 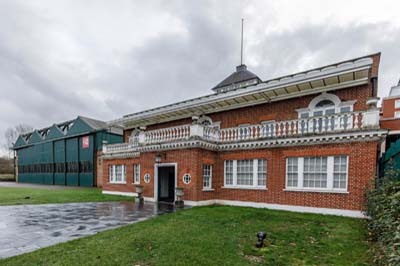 It was moved to Hendon in 1972 for the Museum's opening and purchased by them in 1992. 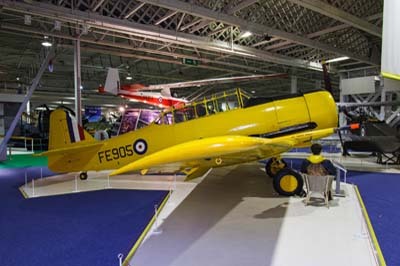 The Shuttleworth Trust has (F909 / G-ABIA). 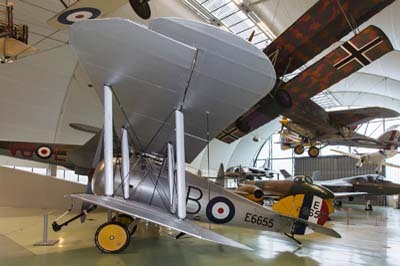 Sopwith Triplane (N5912 and 8385M). A single seat fighter in service from 1917 to 1919 and was capable of 113 mph (182 kmh). 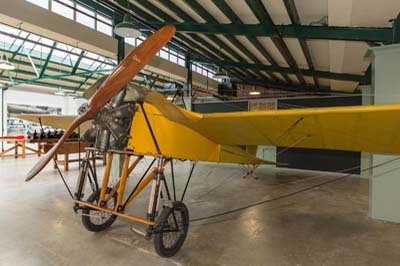 This particular aircraft was manufactured by Oakley & Co in 1917. 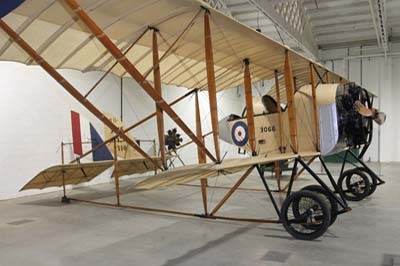 It was delivered to the School of Aerial Fighting at Marske in Yorkshire, by 1919, it had been struck off charge. It was held in store at RAF Cardington till the late 1920s before being moved to the fire dump. 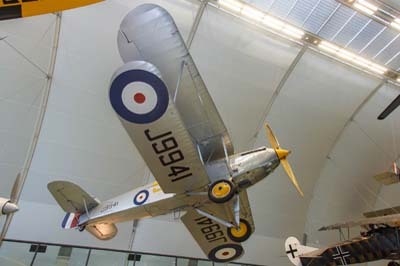 In 1936 it was transferred to RAF Hendon for reconstruction and display. 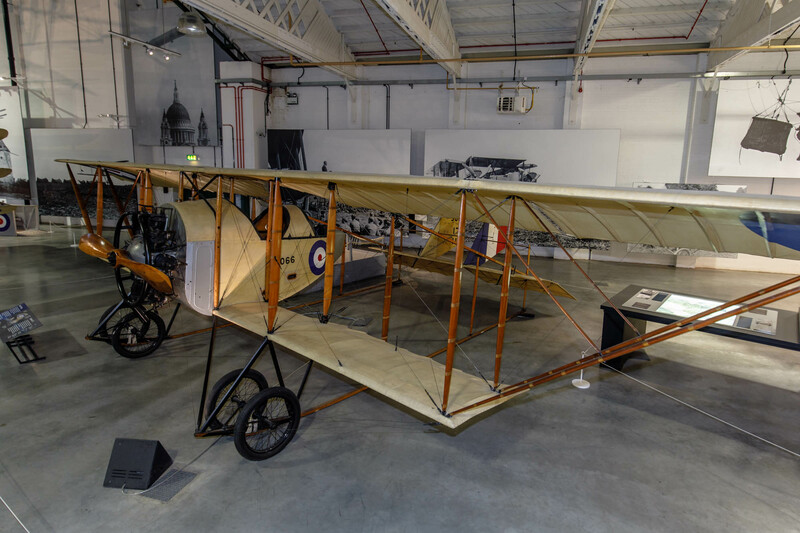 Following long periods of storage, restoration at Henlow and display at various events, the Triplane arrived at Hendon in 1972 and is now on display in the Grahame-White Factory hangar. 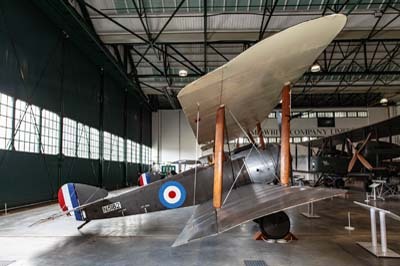 The Sopwith Dolphin 5F.1 (C3988) is a single-seat fighting scout, the pilot sat with his head above the top wing, allowing an excellent view, but he could not see the nose to use it as a reference. 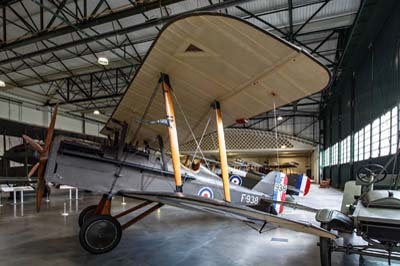 It entered service with the Royal Flying Corps in January 1918 with five RAF squadrons mostly in France. Production continued until 1919, however in 1921 the type was declared obsolete. 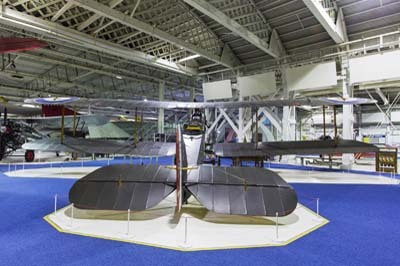 The composite on display is the result of an extensive reconstruction starting at Cardington in 1997 with parts gathered from the late 1960s originating from Sopwith Dolphins; D5329, C4033 and D3725. 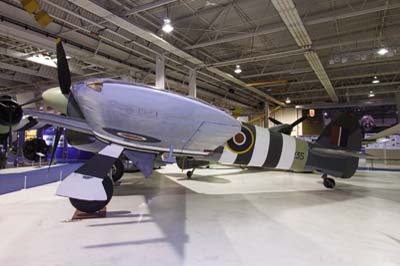 It was completed at Cosford in 2012 and transferred to RAFM Hendon later that year. Bristol F.2b ('E2466' 'I'). 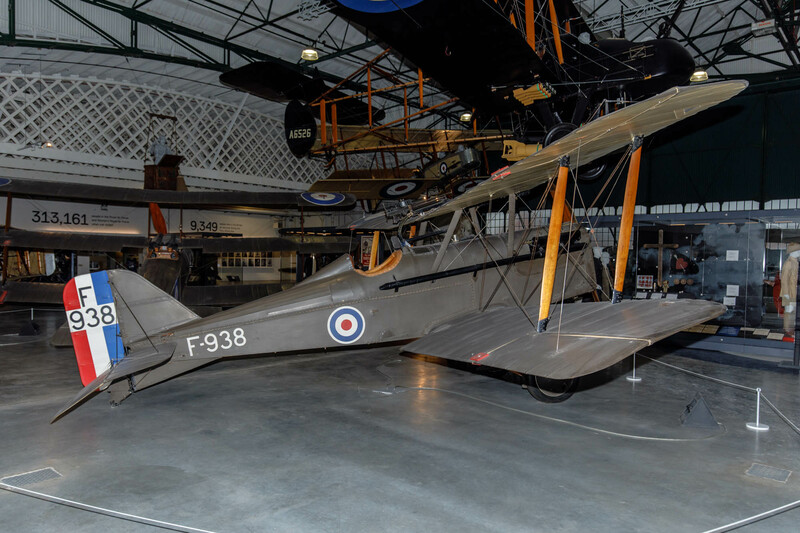 Built by the Bristol Aeroplane Company, the prototype F.2A made its first flight in September 1916. After some modifications the F.2B went into production. Eventually 5,329 examples were delivered, some serving until 1932. E2466 is a composite rebuild using one of six fuselage frames bought privately in 1919 by a farmer to support a barn roof in Weston on the Green, they have no known identity. After recovery of four of them in 1965 they were taken to RAF Henlow. 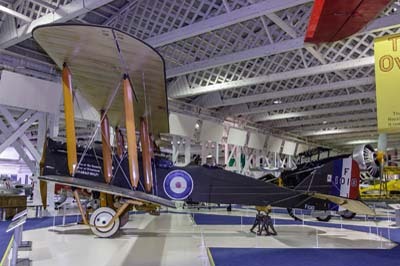 The airframe was restored in 1972 and put on display at Hendon till 1979 when it was taken to Cardington, where it was fitted with a fabricated engine and dummy radiator. 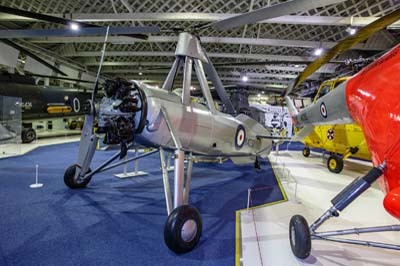 By 1983 a fin, rudder and cowlings were added along with an original tail plane and lower left wing from the Shuttleworth Collection. 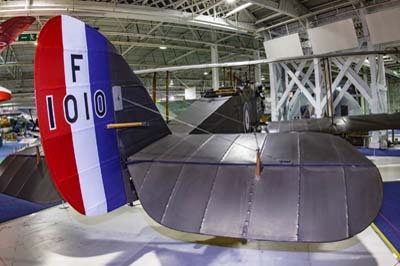 The other wing sections came from a batch of wings built in 1918 but never delivered. These were acquired by RAFM in 1971 along with an original machine gun and wheels. 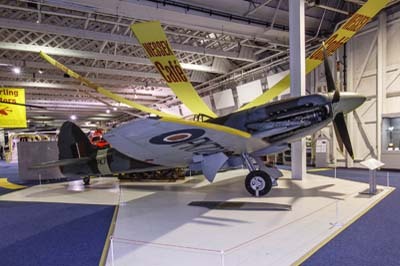 All the additional parts were assembled in 1986 and the composite aircraft was taken to Hendon for display. 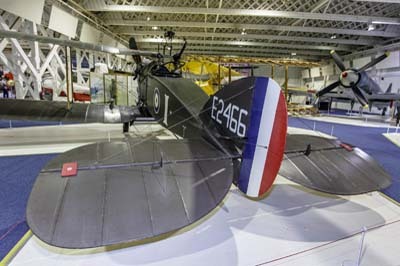 It is painted in the markings of 22 Squadron from 1918 and the starboard side of the fuselage and wing is left uncovered. Sopwith Snipe ('E6655'). Sopwith Snipe ('E6655'). Not quite a replica this Snipe has been constructed using some original parts (pair of port and starboard upper ailerons, instrument lamps and other small components) and also some 'Snipe type' all-metal parts (fin, rudder and horizontal surfaces) from a similar aircraft, a Sopwith Dove (G-EBKY) which had been with the Shuttleworth Collection. The Bentley BR.2 rotary engine is of the type fitted to the Snipe and is original it is fitted with an original Snipe propeller. 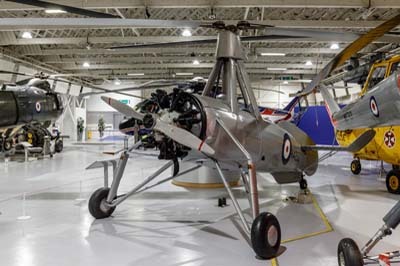 The work completed on the composite Snipe was undertaken by the Vintage Aviator Ltd (TVAL) of Wellington in New Zealand. 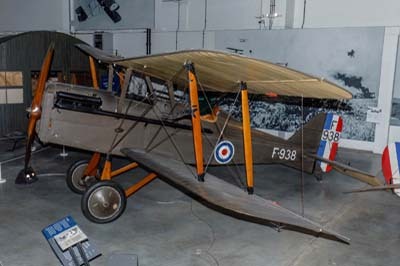 It is painted in a scheme representing a No 1 Squadron aircraft (E6655 'B') originally flown from RAF Hinaidi in Iraq in 1926, which was one of 150 Snipes ordered from Coventry Ordnance Works in March 1918 and were delivered in 1919. 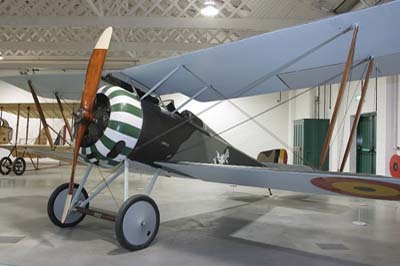 Airco DH.9A 'Ninak' (F1010). The DH.9A was built by Aircraft Manufacturing Co. (Airco) of Hendon (with several sub-contractors) and designed by Capt. Geoffrey de Havilland. He later formed is own company when Airco were taken over by BSA in 1920. The DH.9A was in service from 1918 to 1931 as a two-seat bomber. 900 were built during 1918 in Great Britain, the Russians even produced unlicensed aircraft for the Red Air Force. 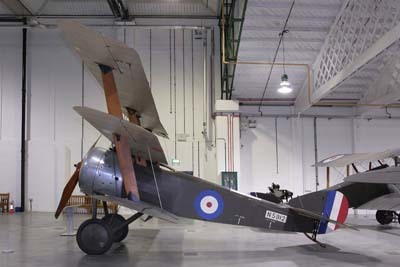 After the World War One the DH.9A was used extensively in Iraq and India. 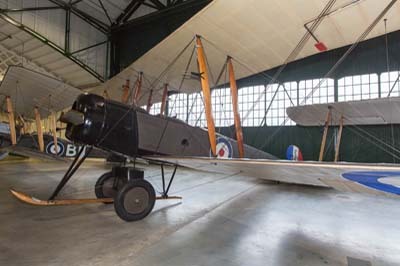 In 1918 the first squadron (110) were equipped with the DH.9A. Unusually 110 Squadron's aircraft including the aircraft on display were purchased for the RAF by His Serene Highness, the Nizam of Hyderabad. The squadron was consequently named 110 (Hyderabad) Squadron and F1010 is also inscribed to this effect. In 1918 on a long range bombing range from its French base F1010 was brought down and captured by the Germans following a forced landing at Kaiserslautern. It was moved to the Berlin Museum as a war trophy. During the World War Two it was damaged in a bombing raid and moved with other aircraft to a forest at Czarnikau, Germany for storage. Discovered by Polish troops in 1945 it was moved to Deblin, Poland. By 1963 it was put on display at a Museum in Krakow. 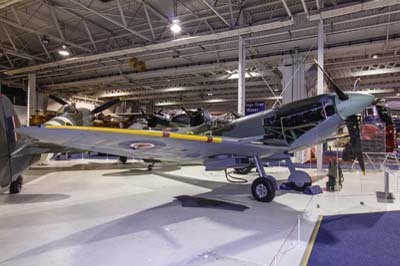 In 1977 the aircraft was swapped for a Spitfire XV1e (SM411) and subsequently restored at Cardington before being put on display at Hendon in 1983. Fokker D.VII (8417 '18' and 9207M). 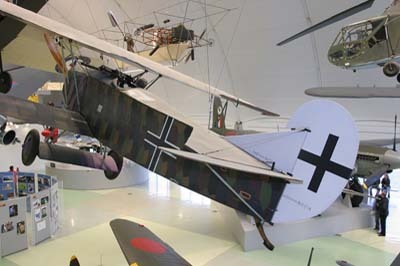 Designed by Reinhold Platz at Fokker, Baron Manfred von Richthofen 'Red Baron' in a competition for the best fighter flew the D.VII, after directing some improvements to be made, it was declared the winner. Production was ordered not only from Fokker but from Albatross and AEG. The first aircraft entered service in May 1918, too late for von Richthofen who had been killed just days before it was introduced. 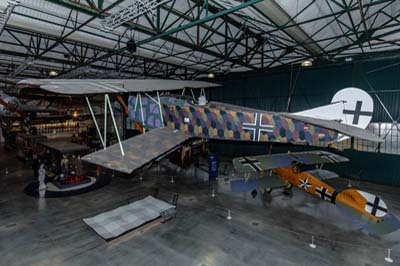 By the end of the World War One this aircraft was considered to be the best German fighter. 120 examples were moved to Holland and further 142 were shipped to the United States at the end of the war. The US Air Force were flying them to the mid 1920s. 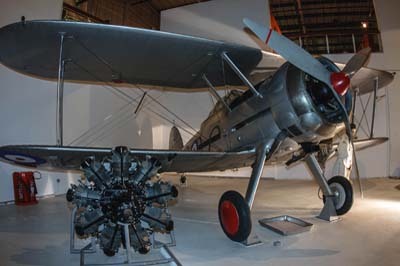 The aircraft on display was bought in France in the 1930s by the Nash Collection. For many years it was in a all red scheme, but following a four year restoration it emerged in 1997 in an authentic five-colour lozenge camouflage scheme. 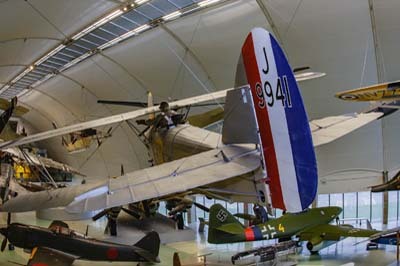 Aircraft from Between the Wars. Bristol Bulldog IIA (G-ABBB but painted as 'K2227'). The Bulldog was built by the Bristol Aeroplane Company and was designed as a single seat day and night fighter. The prototype took to the skies in May 1927. It entered service with the RAF in 1928 but was withdrawn in 1938 in favour of the Hawker Hurricane. The aircraft was exported to Australia, Denmark, Estonia, Finland, Japan, Latvia, Siam, Spain and Sweden. 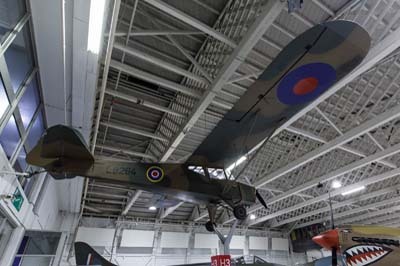 The aircraft on display was built in 1930 and was the Company demonstrator until it was retired and put into store at Filton, Bristol. In 1939 it went to the Science Museum in South Kensington, London. It was used in the making of the 1955 film 'Reach for the Sky' about Douglas Bader, who lost his legs when flying a Bulldog. 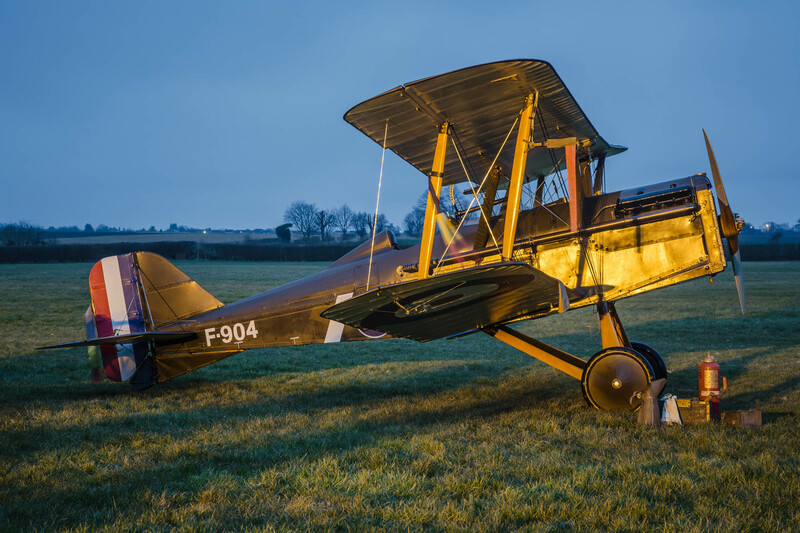 It was restored to flying condition by 1960 and by 1961 it was painted as 'K2227' and presented to the Shuttleworth Trust. It suffered a number of accidents over the next three years. 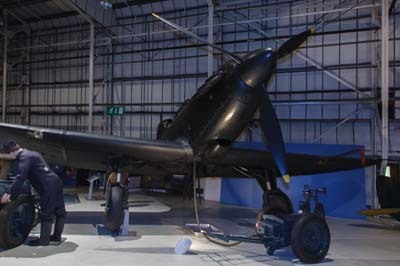 Extensive restoration was carried out throughout the 1990s before it was put on display at Hendon. In February 2010 it had been transferred to Filton. 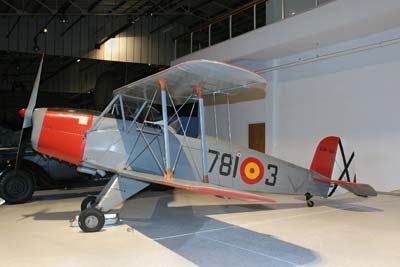 Avro 671 Rota I (Cierva C.30A) (K4232 later SE-AZB). In 1934 Juan de la Cierva, a Spaniard, developed the C.30A autogyro. This unique aircraft was eventually license built by A V Roe & Co as the Rota 1 for the civil and military market, subsequently building 66 examples. 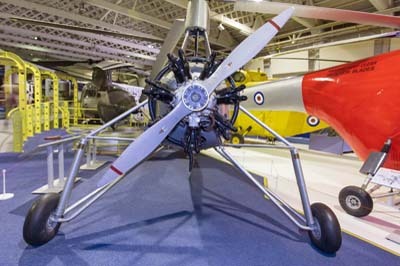 Twelve Avro built Rota 1 autogyros were supplied to the RAF in the mid 1930s (serials K4230 to K4239 and K4296 and K4775), serving with the School of Army Co-operation at Old Sarum. They were used by 1448 (Rota) Flight at Duxford, (later reformed at Halton as 529 Squadron), in great secrecy to calibrate Britain's coastal radar stations during the war. Put into storage in 1945, K4232 was sold to the Cierva Autogiro Co. in 1946, before being sold on in Sweden and registered SE-AZB. 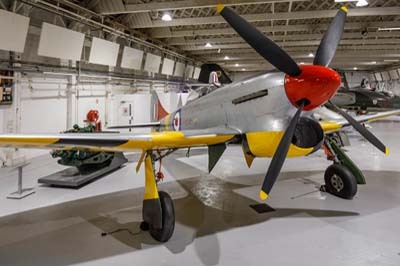 The RAF Museum bought the aircraft in 1977, restoring it to its pre-war RAF markings. Westland Wallace II (K6035 later 2361M). 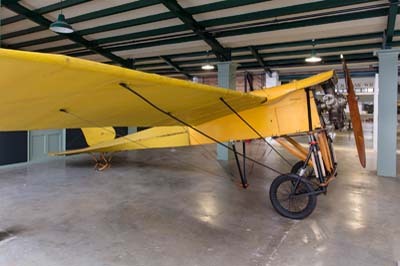 The Wallace was a general purpose biplane built from 1931. Its short service carrier ended with it being used for towing targets and as wireless trainers. 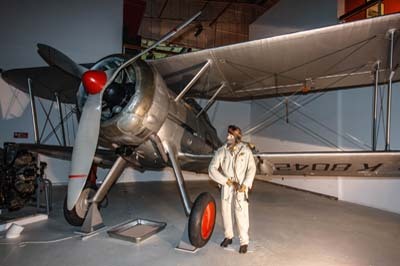 In 1933 a Wallace prototype was fitted with a supercharged Pegasus engine and other necessary equipment for a private venture to fly over Mount Everest for the first time. In the company of a PV3 Torpedo plane and in temperatures of -60 degrees Centigrade, the record was set on April 3, 1933. The Wallace on display served with 502 Squadron in 1936 before moving to RAF Cranwell with the 1 Electrical and Wireless School (later renamed 1 Signals School) a year later. It was retired from flying service in 1940. After being used for ground instruction it was towed to the edge of Cranwell airfield with two others to lay there untouched for 30 years. 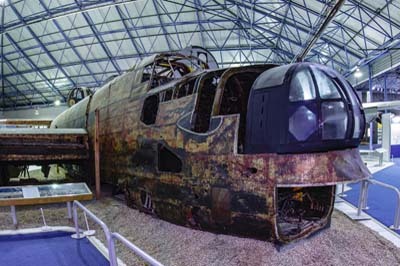 In 1987 restoration was started using 80% of the original parts and in 1993 it was put on display at Hendon. Hawker Hart ('J9941' and G-ABMR). 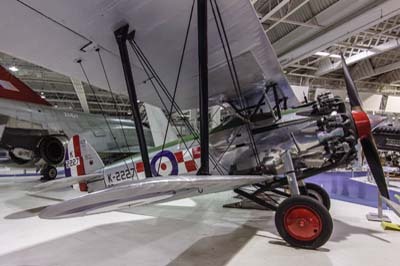 The Hart was designed by Sydney Camm as a two-seater light bomber, it took to the air for the first time in 1928. 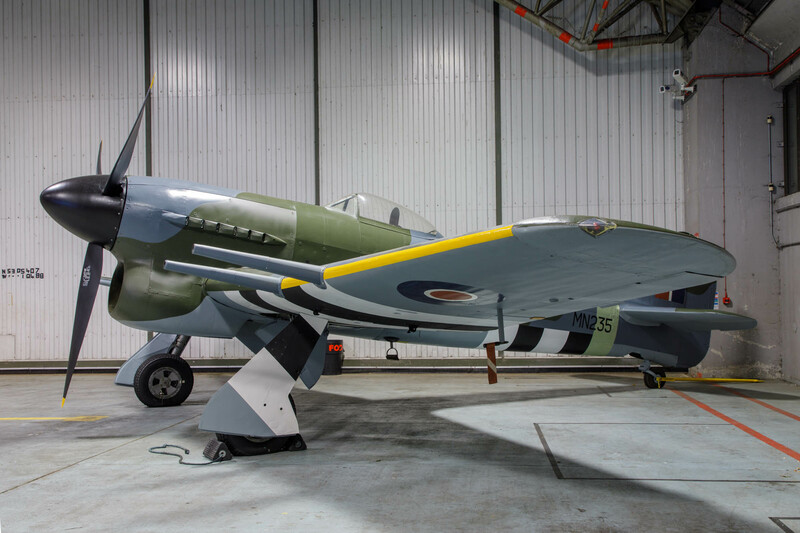 400 aircraft were built for the RAF. 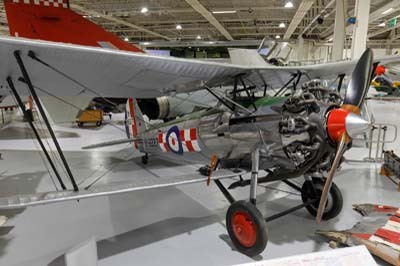 The Hawker Hind and Hector aircraft were developed from the very capable Hart design. Hawker Hart Trainer (K4972). The Hart trainer was a two-seat advanced trainer and was in service from 1935 to 1944. The example on display started life at 2 Flying Training School at RAF Digby in 1935 before moving to 2 FTS at Brize Norton two years later. By 1938 it passed through various Maintenance Units and in 1943 it was transferred to 1546 Squadron at Wigton for instructional use. In 1962 the dismantled aircraft was found in a loft at Nelson Thomlinson School in Wigton, by Solway Group of Aviation Enthusiasts. 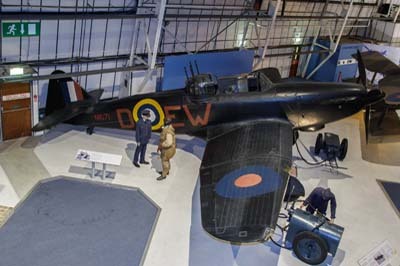 Following a brief period of display at Carlisle Crosby airport it was presented to the RAF Museum and put in to store at Henlow a year later. In 1968 it went to St Athan for restoration and display. In 1972 it was put on display at Hendon and in 1987 further restoration was carried out at Cardington prior to its move to Cosford for display in 1992. By 2002 it was back at Hendon and later Cosford by 2018.
de Havilland DH.60M Gypsy Moth (G-AAMX ex NC926M). de Havilland designed the Moth from the 1920s as an aircraft to meet the needs for the fast growing aero clubs and private pilots. In 1926 they re-engine the Moth with the new de Havilland Gypsy engine. The RAF flew 134 Gypsy Moths up until 1939 when they had all been retired. However, at the start of the war 146 civilian owned Moths were impressed into service by the RAF for communications duties. 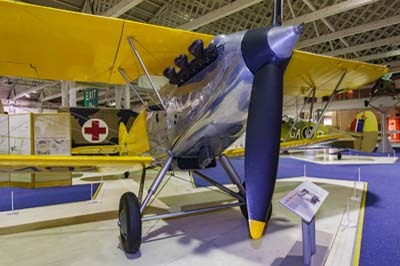 G-AAMX is one of 29 DH.60M Moths built by Moth Aircraft Corp. at their St Louis factory from 1928. It was sold to Plymouth Airways, Plymouth, New Hampshire as NC926M on July 1930, but was written off in a crash on August 7, 1930. From 1930 till 1983 it was stored by a number of owners till it was bought by Cliff Lovell who shipped it to the UK and stored it initially at Walkeridge Farm. John Parkhouse later bought the damaged aircraft and started a 2,000 hour restoration project to return it flying condition which was completed by 1987. A previously unused period registration was obtained and it was moved to Shoreham. Following the death of John Parkhouse in 1993 and after 127 post restoration flights, its C of A expired in 1994. 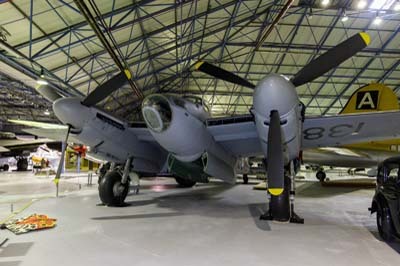 It was donated by the family to the RAF Museum and moved to Cosford in 1996 and later to Hendon in 2003. In January 2012 it was put in to storage. 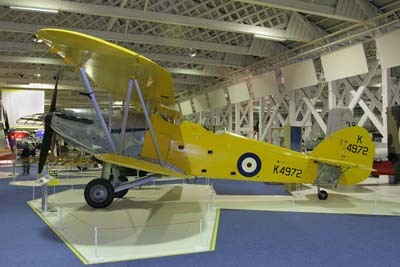 de Havilland DH.82 Tiger Moth (T6296). 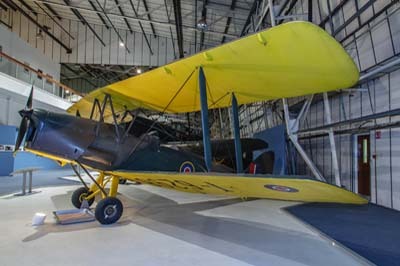 The Tiger Moth was used by Elementary Flying Training Schools (EFTS) from 1932 to 1951. This example started its military service with 1 EFTS in 1941 and later 7 EFTS in 1942. At the end of the war it was transferred to the Fleet Air Arm and was in use at a number Royal Navy Air Stations until 1966. 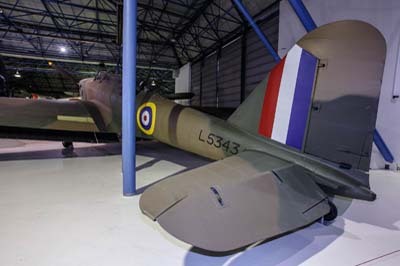 Following a period of storage at RNAS Fleetlands its was transferred to RAF Henlow in 1972 for the RAFM later in the year. 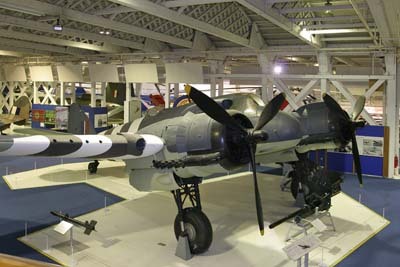 In 1990 it was moved from the Main Hall to the Battle of Britain Hall. Miles M.12 Mohawk (G-AEKW ex HM503). One of a series of monoplanes designed by FG Miles, it was built and first flew in 1936 by Philips and Powis Aircraft at Woodley. The Mohawk was designed as a fast, long-range light touring aircraft for the famous American aviator Colonel Charles Lindbergh. He needed it for business trips around Europe with his wife Anne. 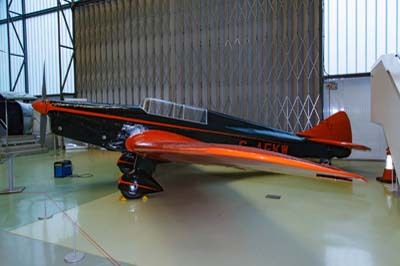 The colour scheme of black and orange was chosen by Lindbergh for high visibility. It had to have adjustable rudder pedals as he was over six feet tall, with rear seats that could convert to a bed. Only one Mohawk was built. Handed over officially to Lindbergh in 1937 he then flew it via Italy to India. He returned via Serbia, Greece and Austria. In 1938 he flew to Russia via Germany, returning via Poland, Czechoslovakia, France and Holland. 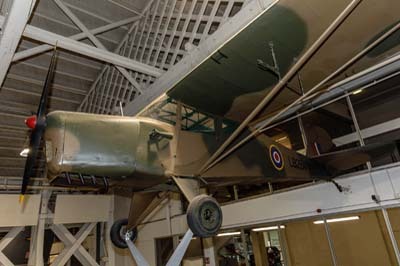 Lindbergh presented the aircraft to the British Government at the outbreak of war for use as a communications aircraft. It survived the war after limited use, restored to the civil register in 1946, it was unfortunately written off in an accident in Spain in 1949. The wreckage was sold to the Granada Aero Club who intended to repair it, however by 1973 it was discovered in a scrap yard in 1973 near Tablada. 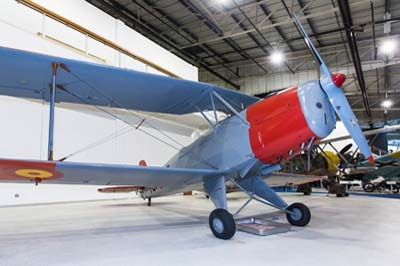 In 1975 it was shipped to the Aeroflex Museum Foundation Collection at Santee, North Carolina for restoration. In 2000 it was presented to the RAF Museum and delivered to RAF Wyton later that year. 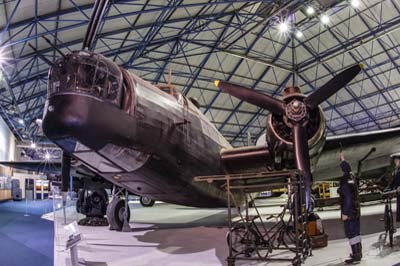 Further restoration was done at Michael Beetham Conservation Centre at Cosford from 2002 until 2006. In 2008 it was moved to the RAFM for display in Milestones building. In January 2012 it was put in to storage. Gloster Gladiator (K8042). 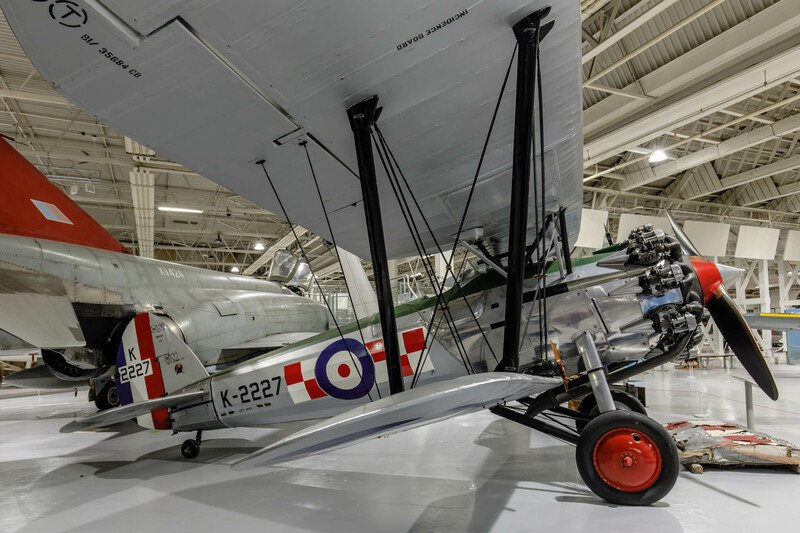 The Gladiator was the last biplane fighter when it entered service with the RAF in 1937. Unfortunately it was no match for the technologically more advanced German aircraft at the start for World War II. K8042 was delivered in 1937 and immediately went in to storage. By 1941 it was put into service as the Station Flight at RAF Boscombe Down with the A&AEE. In 1942 it was transferred to 5(Pilots) Advanced Flying Unit at RAF Turnhill, before moving on in 1943 to 61 Operational Training Unit at RAF Rednal. Damaged in 1944 it went into storage at Little Rissington until being struck off charge in 1948 but being retained for historical reasons. In 1965 it emerged from the RAF Museum store at Henlow to be restored in in 1967 for display at the RAF's 50th Anniversary Royal Review in 1968. In 1971 it arrived at the RAF Museum at Hendon moving to the Battle of Britain Hall in 1978 and on to IWM at Cosford by June 2018. 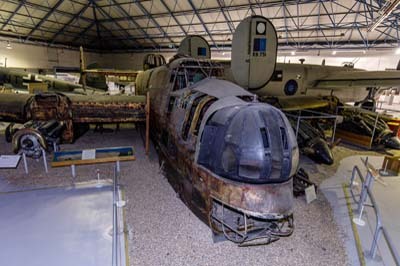 The wreckage of Gladiator II (N5628) written off in 1940 is also on display nearby. North American AT-6 Harvard IIB (FE905 formally 31-329 RDAF and LN-BNM). 17,096 AT-6s were built before and during the World War Two. In USAAF service it was known as the AT-6 Texan, the 5,000 supplied to British and Commonwealth Air Forces were known as the Harvard. The first order for the Harvard was placed in June 1938. Following the outbreak of war most deliveries were made to Canada, Southern Rhodesia and the United States where pilot training was safer. 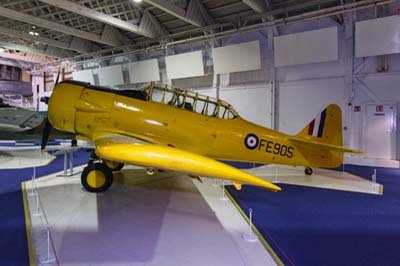 The last Harvards were withdrawn from service with the RAF in the 1950s. 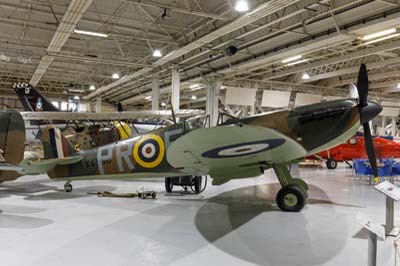 FE905 was built in 1943 by Noorduyn Aviation in Montreal, Canada and was supplied to the RAF under the lend-lease program and delivered to the RCAF with 41 Service Flying Training School at Weyburn, Saskatchewan. By 1943 it was transferred to 37 FTS at Calgary, Alberta later returning to Weyburn with 8 SFTS where became surplus to requirements and was struck off charge in 1946 having only flown 76 hours. In 1949 it was sold to the Danish Air Force becoming 31-329 and initially based at Kastrup. By 1960 having flown 1,900 hours it was struck off charge and sold in Norway for target owing duties as LN-BNM. 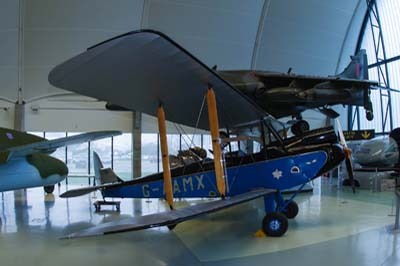 After its C of A had expired in 1968 it was sold to the Historic Aircraft Museum at Southend, Essex and delivered in 1972. In 1983 the museum auctioned the aircraft for £6,000 and by 1985 it had passed to the RAF Museum at Cardington where it was to be restored. 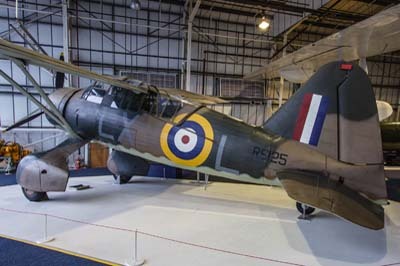 In 1991 it was loaned to the Newark Air Museum for three years before it was moved to Hendon. CASA 1-131E Jungmann (E.3B-521 '781-3'). 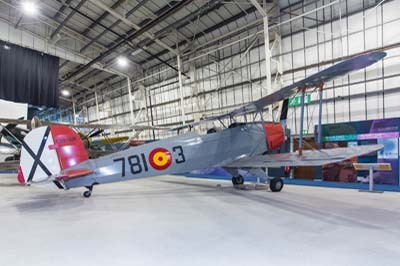 The aircraft of display was formally with Spanish Air Force (Ejercito del Aire) and was licence-built version of the Bücker Bü-131 Jungmann by Construcciones Aeronauticas S.A. (CASA) of Spain. 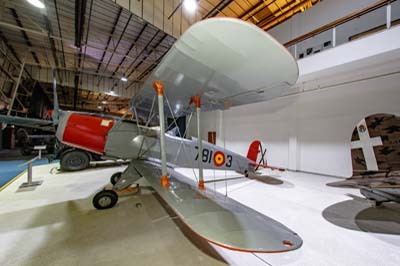 Production continued in Spain until the early 1960s and it flew with the Spanish Air Force till 1968. The Bu-131 was designed as a primary trainer in 1933, taking to the air a year later. 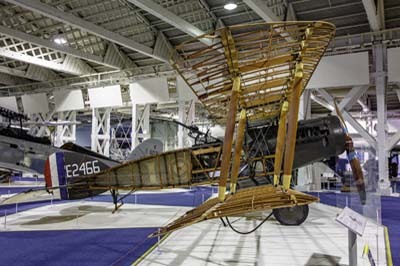 The Jungmann was also licence-built in Hungary, Czechoslovakia and Japan. 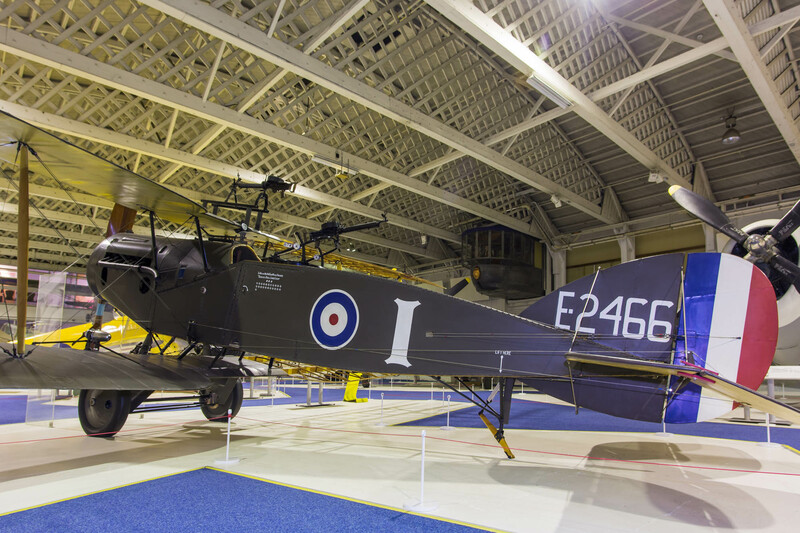 This aircraft was acquired by the Museum in exchange for a Cierva C.30 Autogiro, as an example of German training aircraft to compliment the impressive collection of fighters and bombers. This particular E.3B was built in the 1950s by CASA in Spain. It served with 781 Squadron till the early 1980s. They were finally put into storage at Granada where I was fortunate to see a hangar full of these fine aircraft in 1982. Avro Anson I (W2068 '68'). The Anson was designed in 1936 for maritime reconnaissance duties for which it quickly became obsolete when war broke out and it was more ably employed as a crew trainer and communications aircraft. By 1952 over 8,000 examples had been built by Avro in Great Britain with nearly 3,00 more built in Canada by Canadian Federal Aircraft. The Anson remained in service with the RAF until 1954 and 1968 for the later redesigned C.19 variant, with many moving on to civilian operations. 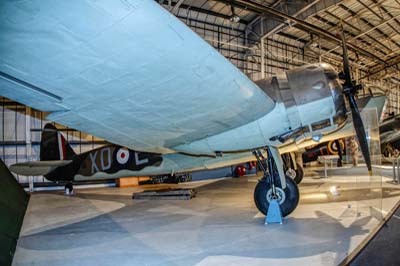 This example was built at the Avro factory at Newton Heath in Birmingham in 1941 and shipped out to Australia where it served till the end of World War II. In 1946 is was sold off becoming VH-ASM with East-West Airlines Pty till 1950. Bought by Marshall Airways in 1951 it was flown by them from 1956 till 1962. From 1972 after a period of storage it was put on display at various locations. 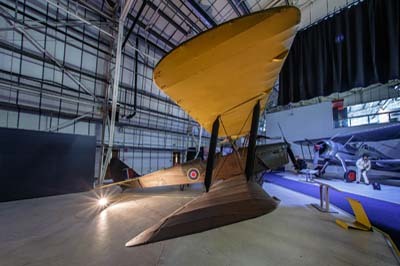 Following a restoration in 1996 the fuselage only was put on display at RAFM Hendon. It is displayed on an original 'Queen Mary' semi-trailer which were built to transport non-flyable aircraft between airfields and factories. Airspeed AS.10 Oxford I (MP425 and G-AITB). The Oxford was a three seat advanced trainer in service from 1937 to 1954. They were used to train pilots for night operations. Originally named 'Blind Approach Training Flights' (BAT Flights), in 1941 they were renamed 'Beam Approach Training Flights'. 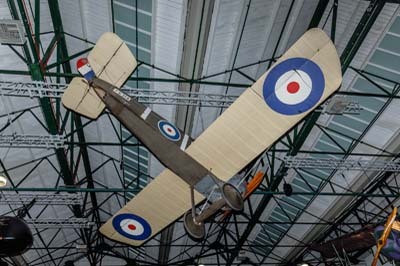 The aircraft on display was built by the Standard Motor Company in Coventry. In March 1943 it was assigned to the No.1536 (Beam Approach Training) Flight at RAF Spittlegate. It finished it service carrier with No.18 (Pilot's) Advanced Training Unit at RAF Peterborough, before going in to storage with 12 MU. In 1946 it was sold to Air Service Training at Hamble and registered as G-AITB. 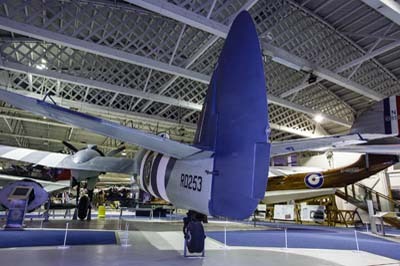 it was withdrawn in 1961 and acquired by the RAF Museum in 1969. 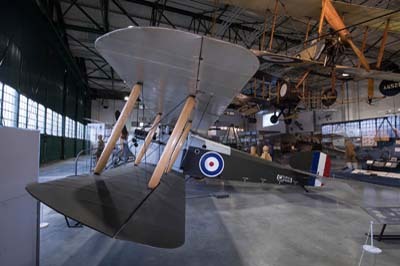 Following a complete restoration at Cardington it was loaned to the Newark Air Museum in June 1991 for three years. 42 Oxfords were transferred to Belgium for use as communications aircraft with 367 Squadron at the end of the War, remaining in service till 1954. Click for additional information. Westland Lysander III (R9125 'LX-L'). 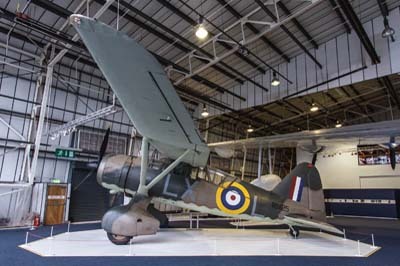 The Lysander was designed to operate closely with the Army as a special transport and observation aircraft. It was a very rugged aircraft able to land on small and unprepared landing fields. Four squadrons with 170 Lysanders were moved to France in 1939. At the end of their time in France only 50 aircraft returned. They were later used to patrol coastal areas for downed airmen and could deploy dinghies when necessary. 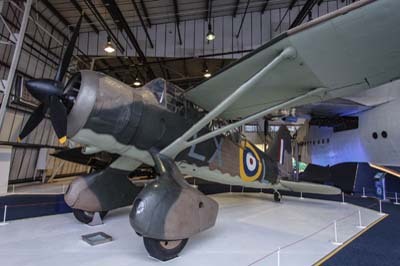 The Lysander operated with the RAF from 1938 to 1946. The aircraft of display operated with 225 (Army Co-operation) Squadron at RAF Tilshead in 1940. It was modified for target towing in 1941 before being assigned to its first Gunnery School. In 1944 it was assigned to 161 (Special Duties) Squadron at RAF Tempsford. At the end of the war it went in storage, before transferring to the RAF Museum storage facility at Henlow in 1967. It moved to Hendon in 1971. Taylorcraft Auster Mk.1 (LB264 later G-AIXA). 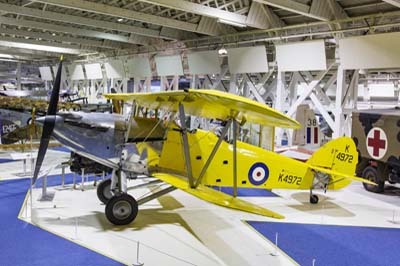 Taylorcraft Aeroplanes (England) based in Leicestershire developed the US designed Taylorcraft Plus C and D models in 1940 to produce the Taylorcraft Auster Army Observation Post (AOP) aircraft. This light and manoeuvrable aircraft could operate from small airstrips and could evade enemy fighters by flying at very low-level. It was used to advise field commanders of enemy troop movements and artillery. Taylorcraft Aeroplanes (England) later became Auster Aircraft and its AOP aircraft formed the basis of the modern Army Air Corps. 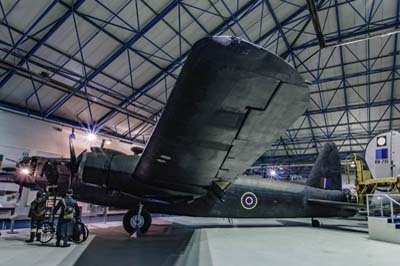 LB264 was built in 1942 and was delivered to the A & AEE at Boscombe down. 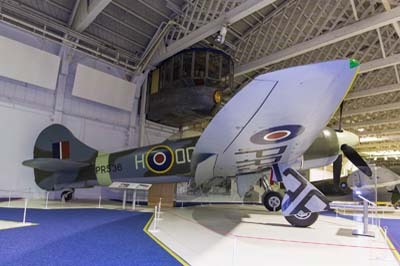 It later moved to 653 Squadron at Rearsby and was used for camouflage tests. In 1943 it was transferred to 1 Elementary Flying Training School (EFTS) at Holwell Hyde near Hatfield and then to 22 EFTS at Caxton Gibbet. 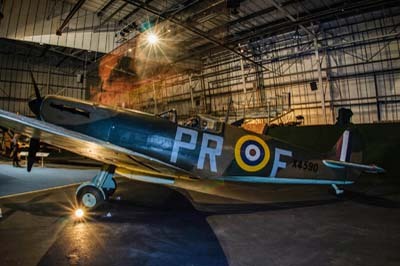 At the end of the war it was sold to Cotswold Aero Club which was the first of many operators and private owners till in 2000 it was restored in its original 1942 camouflage and markings before being sold to the RAF Museum in 2002, it arrived at Hendon in 2003. Hawker Hurricane I (P2617 'AF-F' also 8373M). It was designed in 1934 and entered service in 1937 as the fastest fighter in service by 100 mph. By 1939 500 were in service with eventually 32 squadrons being equipped with them. Hurricanes shot down more enemy aircraft during the Battle of Britain than all the other air and ground defences combined. They later were used in North Africa and in the Far East against Japan. 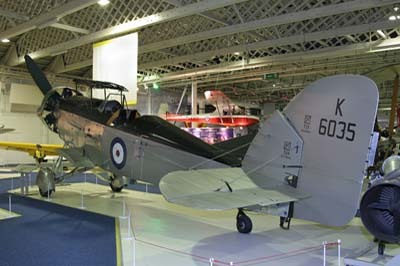 The aircraft on display was used in the film 'Reach for the sky'. Supermarine Spitfire I (X4590 'PR-F' also 8384M). The first Spitfire Mk.1s entered service in August 1938 and by the outbreak of war nine squadrons were equipped with them. The Spitfire was the only aircraft that could match the German Messerschmitt Bf-109E in aerial combat during the Battle of Britain. 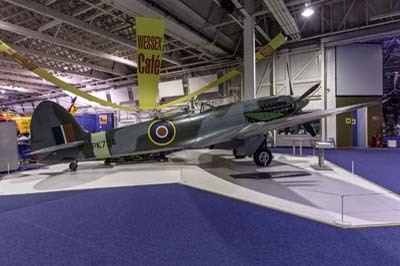 The Spitfire Mk.1 on display entered service in October 1940 with 609 Squadron based at Middle Wallop later moving to RAF Warmwell in Dorset. After transferring to 66 Squadron at Exeter in 1941 it was briefly moved 57 Operational Training Unit at RAF Hawarden before passing to 303 (Polish) Squadron at RAF Speke Liverpool in July 1941. By 1942 it was employed by various training units before being moved to a Maintenance unit and long term storage. 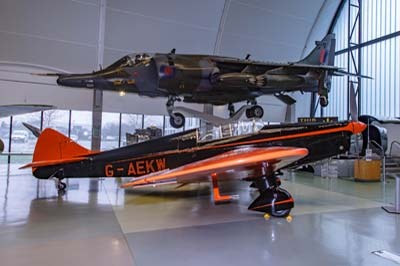 In 1972 it was moved to the RAF Museum store at Henlow before being put on display at Cosford in 1976 and at Hendon in 1978 in the Battle of Britain Hall. Supermarine Spitfire Vb (BL614 'ZD-F'). 6,500 Mk.Vs were built between 1941 and 1943 and served with over 140 squadrons. By 1944 only five squadrons still operated the variant. 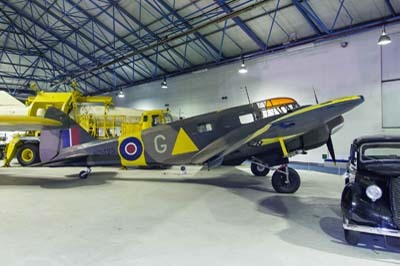 BL614 was delivered in 1942 to 8 MU at Little Rissington and was later transferred to RAF Drem near Edinburgh where it served with 611, 242 and 222 Squadrons. 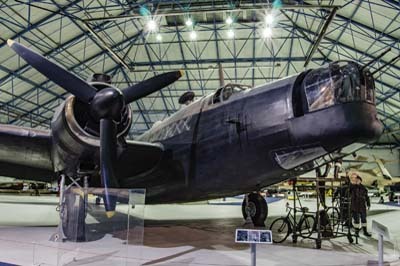 In 1943 it served with 64 and 118 Squadrons before it was moving to 2 School of Technical Training at RAF Cosford and later to 6 School of Technical Training at RAF Hednesford. By 1948 it was with 7 Recruits Centre at RAF Bridgenorth before becoming the gate guard at RAF Credenhill from 1955. 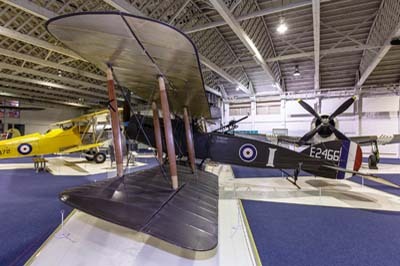 After appearing in the film 'Battle of Britain' it was put on display at RAF Colerne from 1972, RAF St Athan from 1975 and at the Manchester Air and Space Museum from 1980. 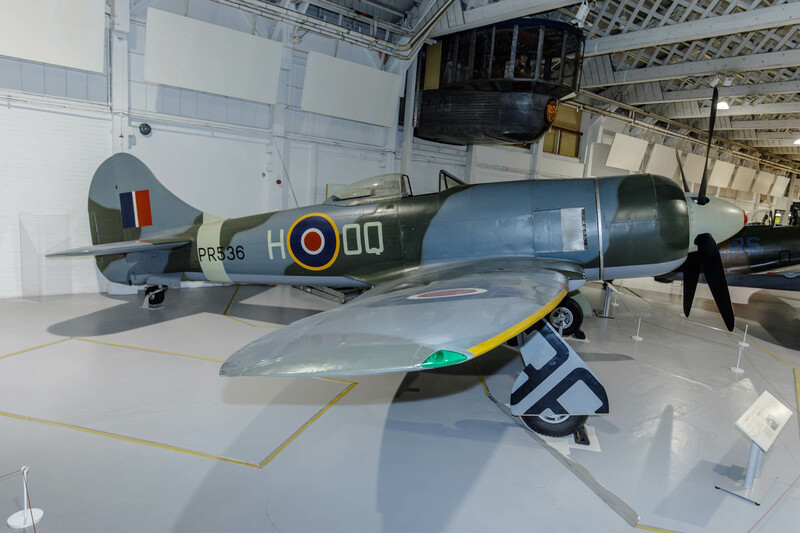 Medway Preservation Society started a restoration from 1995 once completed it was moved to RAFM at Hendon in 1997. Supermarine Spitfire F.24 (PK724 and 7288M). 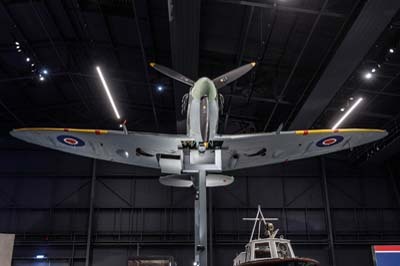 The Spitfire F.24 was the final variant of the illustrious World War Two fighter. Only 70 examples were supplied to the RAF and mostly went into storage as in 1946 the type was now making way for jet aircraft. Built at the Castle Bromwich factory PK724 was handed over to 33 MU at Lyneham where it stayed till 1950 with only seven hours on the clock. It was then moved to 9 MU at Cosford where it was declared non-effective in 1954 with most of the other F.24 which were scrapped in 1956. By 1961 PK724 was gate guardian at RAF Gaydon till 1970 before moving to Hendon. Two other Spitfire F.24s survive, PK683/7150M Southampton Hall of Aviation (Solent Sky) and VN485/7326M at IWM Duxford. 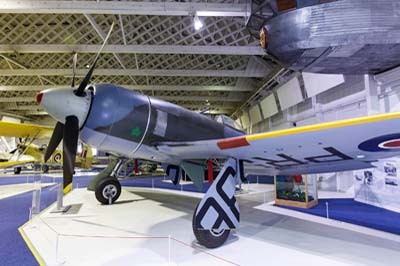 Hawker Typhoon 1B (MN235) on display at RAF Coningsby in October 2018. Hawker Typhoon 1B (MN235). The Typhoon was designed as a low-level and close-support ground attack fighter-bomber for use against tanks, armoured vehicles, airfields and communications. Entering service in 1942, it was the first 400mph (640kmh) fighter with the RAF. The Typhoon was withdrawn from service at the end of the war. 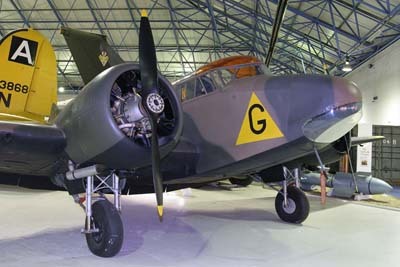 This actual aircraft was built by Gloster Aircraft Company and delivered to the RAF in 1944. Shortly after delivery it was transferred to the United States for evaluation. 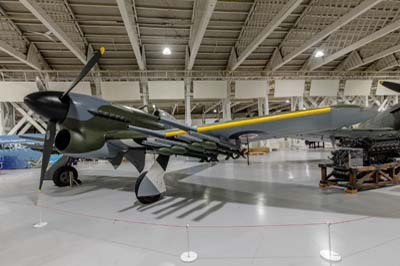 It was flight tested for two months, before being moved to the Smithsonian Institution's National Air Museum. It is now the only surviving complete Typhoon and in 1967 was exchanged for a Hurricane for the 50th Anniversary of the RAF celebrations. It was refurbished at RAF Shawbury before moving to Hendon in 1972. 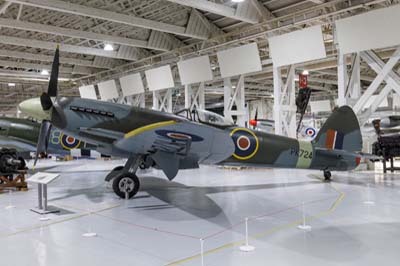 In February 2014 it was dismantled and shipped to the Canada Aviation and Space Museum in Rockcliffe, Ottawa, for D-Day’s 70th anniversary returning to Hendon in November 2018 after a spell at RAF Stafford and RAF Coningsby. Hawker Tempest II ('PR536' 'OQ-H' and formally Indian Air Force HA457). 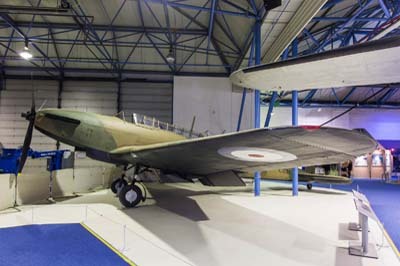 In 1940 Hawker's Sydney Camm, was at work designing a successor to the Typhoon. The result was the sleeker Tempest, which took to the air in February 1943. 3 Squadron, converting from the Typhoon, were the first squadron to go operational in April 1944. It was soon found to be more superior than its German adversaries in their Bf 109s during the D-Day landings. They were also used to intercept the V-1 flying bombs, destroying around 800 by August 1944. More than 1,400 Tempests were built and only twelve survive today, two of those are at Hendon. This Tempest II (PR536) was built in 1945 by Hawker Aircraft at Langley and was shipped to India. After the war in 1947 it passed to the Indian Air Force, ending up as a decoy at Poona by 1969. It was brought back to Great Britain in 1979 and eventually went into storage at Cardington in 1987. 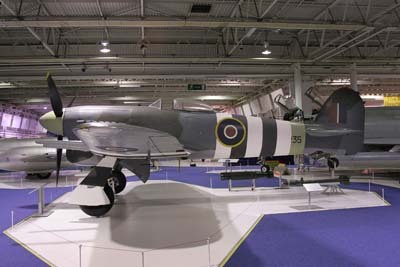 Following restoration at Duxford it was put on display at Hendon in November 1991 in 5 Squadron colours. Hawker Tempest TT.5 (NV778 and 8368M). This is a converted Mk.5 for target towing. Built in November 1944 and after seeing little action was put in to storage before being converted in 1950. Following a period of gate-guarding at Middleton St. George and Leeming it was moved to Cardington for restoration to flying status and flew again in the early 1970s. It finally went on display at Hendon in 1972. 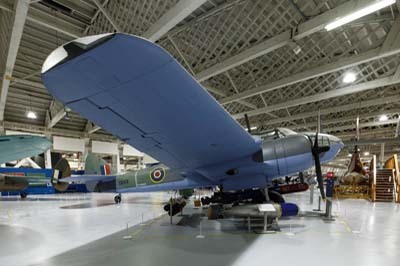 In 1991 it was restored at Cardington as a TT.5 and after a further period of storage it was displayed at Cosford before returning to Hendon in 2003 in a 233 OCU scheme. 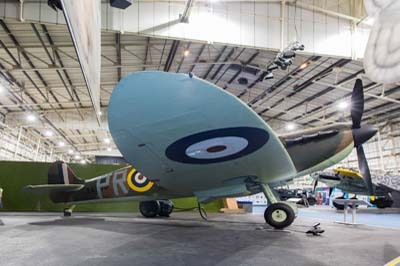 It is on display at the Milestones of Flight Exhibition. Bristol Bolingbroke IVT ('L8756' really ex RCAF 10001). The Bristol Blenheim was developed in 1936 as a light bomber. The Blenheim I was superseded by the Blenheim IV in 1938 which was fitted with a longer nose. They were used for day and night bombing raids on occupied ports till 1941 and some were converted to night fighters but had little success due to their lack of speed. 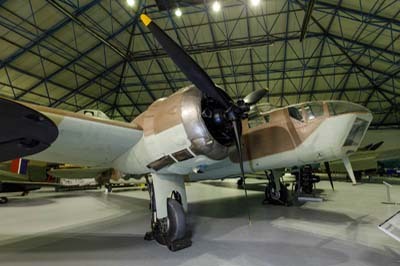 Some Blenheim IV's served in North Africa and in the Far East. 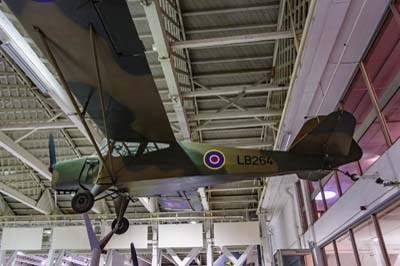 The Bolingbroke IV on display was license-built by Fairchild Aircraft in 1941 and delivered to the Royal Canadian Air Force in 1942. After serving with Bombing and Gunnery Schools in Canada it was struck off charge in 1946 and sold to a private owner. 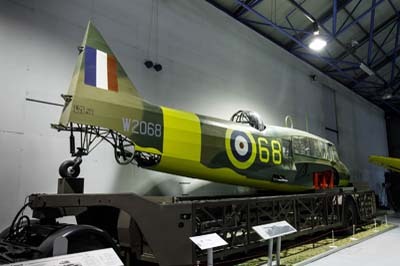 It was eventually purchased by the RAF Museum in 1966 and moved to Henlow in 1969 for storage. Restoration began in 1972 by the A&AEE at Boscombe Down and was completed in 1978 and it was transferred to Hendon later in the year. It is painted as 'L8756' to represent an aircraft from 139 Squadron. Bristol Beaufort VIII ('DD931' and 9131M). The Beaufort first flew on October 15, 1938 entering service with 22 Squadron in November 1939. It had a crew of four and was in service until 1946. Throughout the early part of the war they were operated by RAF Coastal Command as a torpedo bomber. They were also used to drop magnetic mines until 1943. Later many Beauforts were flown in Africa and in the Far East. 1,380 were built including 700 in Australia. 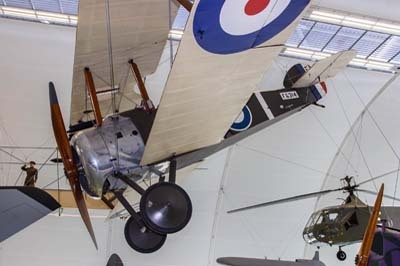 The aircraft on display has been assembled using part recovered from several aircraft found in New Guinea combined with re-manufactured parts. 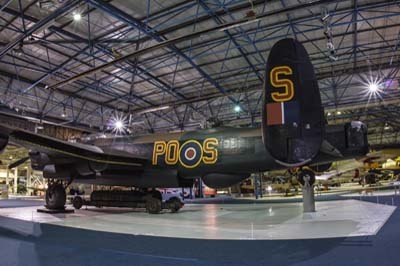 It is painted in the markings of 39 Squadron as 'DD931' when operating from Malta in 1942. Bristol Beaufighter TF.X (RD253 and 7931M ex FAP BF-13). 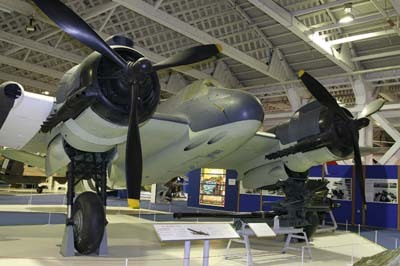 The Beaufighter was a two-seat anti-shipping strike fighter, remaining in service from 1940 for 20 years. It carried four 20mm cannon in the nose and six machine guns on the wings and another on top of the fuselage. It could also carry one torpedo or eight rockets and two bombs. 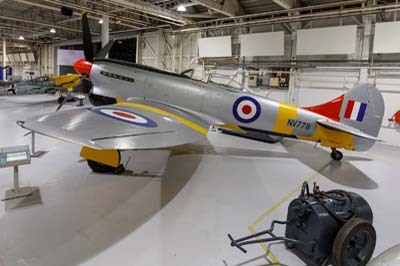 The prototype first flew on July 17, 1939, RAF Fighter Command taking delivery of the first aircraft in April 1940. They were fitted with radar and performed well at night against Germany. 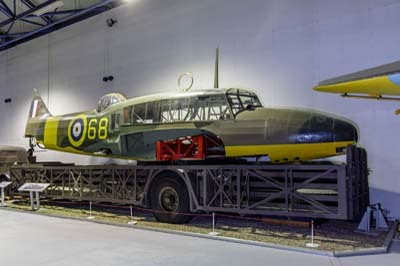 The last of 5,562 Beaufighters was delivered in September 1945. Towards the end of it's career many were converted to target tugs. 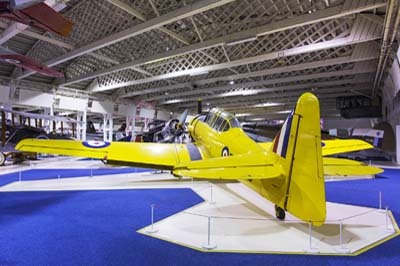 The aircraft on display was built by the Bristol Aircraft Company at Oldmixon and delivered to the RAF in November 1944. In 1945 it was transferred to the Portuguese Navy for maritime patrol. After a period of ground instruction use it was given to the Lisbon Technical Institute. It was stored out side for 15 years before being presented to the RAF in 1965. At RAF Bicester it was cannibalised for spares for another Beaufighter that was being prepared for Canada. The remains were sent to St.Athan where RD253 was completely restored and moved to Hendon in 1972. Vickers Wellington T.10 (MF628 and 9210M). Using a very strong geodetic type of construction developed by Barnes Wallis, the Wellington went into service in 1938. Designed as a long range bomber, it was also found to be an effective torpedo carrier with Coastal Command. 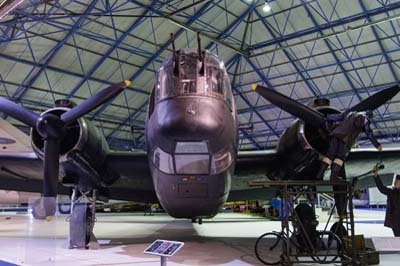 By 1941 four-engine bombers were introduced and the Wellington was transferred to Transport and Training Commands. 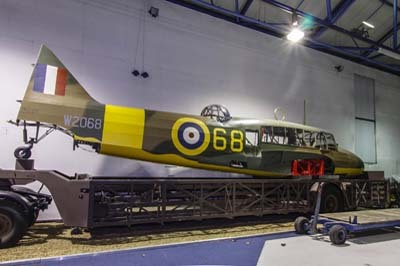 The example on display was delivered to the RAF in 1944 as a Wellington 10. In 1948 it was converted to a T.10 and transferred to 1 Air Navigation School but suffered an accident in 1951. Following repair it was sold back to Vickers in 1955 who presented it to the Royal Aeronautical Society. 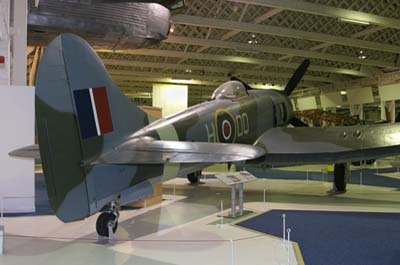 In 1964 it was placed on permanent loan to the RAF moving to Hendon in 1971. A front gun turret was fitted in 1981. 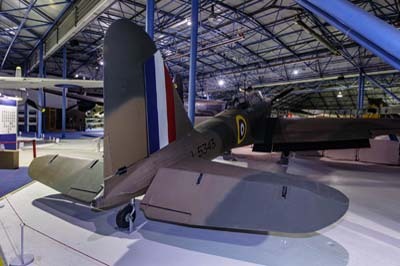 In 2010 it was moved to Cosford for restoration. Fairey Battle 1 (L5343 with parts from L5340). Built in 1939 it served with 266 then 98 Squadron before its transfer to Coastal Command in 1940 for operations in Iceland. Soon after its arrival it force landed in a remote area and was subsequently torched. In the early 1970s parts were recovered for restoration at RAF Leeming and later at Henlow with extensive part from another Battle L5340. 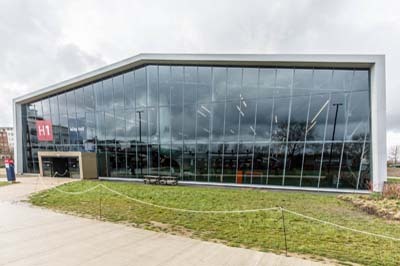 Restoration was completed at St.Athan. (The finished restoration was completed in 1990 and is around 40% original, 30% L5343 from Iceland, 25% L5340 and 5% from donated components. It retains the serial L5343 as the major identifiable parts are from that aircraft). Further work was done at Roachester from 2006 till 2008 when it moved to RAFM Hendon and Cosford before it was ready for display in 2010. Boulton Paul Defiant I (N1671 'EW-D' also 8370M). 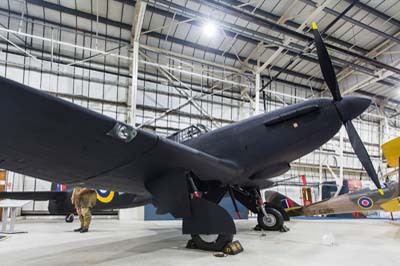 The Defiant entered service in 1939 as a two-seat turret armed fighter. Unfortunately the concept of a rear facing turret and no forward facing guns was not very successful. After suffering considerable losses in daylight its operations were switched to night-time. Despite adding radar to improve its effectiveness, the Defiants were withdrawn in favour of Beaufighters and Mosquitos. N1671 entered service in August 1940 with 307 Zwowski (Polish) Squadron at RAF Kirton-in-Lindsey and later at Blackpool, Colerne and Exeter. After transfer to 153 Squadron at Ballyhalbert and 285 Squadron at Honily in 1942 it was withdrawn from service in 1943. Following periods of storage at various airfields it ended up at St Athan in 1960 before moving on to Finningley in 1968. It was transferred to Hendon in 1971 and moved to the Battle of Britain Hall in 1978. 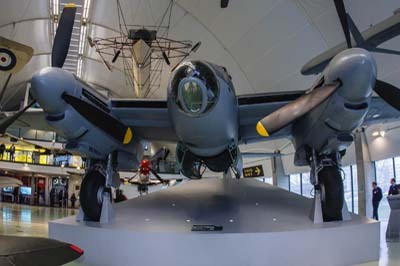 It was no longer on display by December 2009 having moved to Cosford in 2018.
de Havilland DH-98 Mosquito TT.35 (TJ138 'VO-L' and 7607M). The Mosquito was designed to be fast, very fast. Constructed out of wood it was light and with conventional armament eliminated it was very light. It could carry 1,000 lb of bombs 1,500 miles at a speed of almost 400 mph. This was twice the speed of contemporary British bombers. Using the experience of building the DH.88 Comet Racer de Havilland conceived the aircraft in 1938, with the prototype day bomber taking to the air for the first time in November 1940. 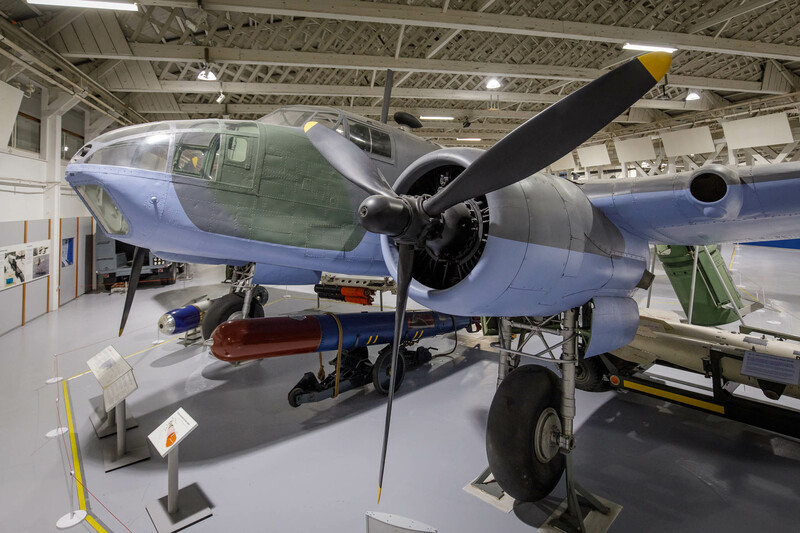 The Mosquito would eventually be used in a variety of roles, including; low-level tactical daytime bomber, high altitude night bomber, pathfinder, day and night fighter, trainer and for reconnaissance. Towards the end of its career it was used as a target tug. 7,781 were built the last was completed in 1950. 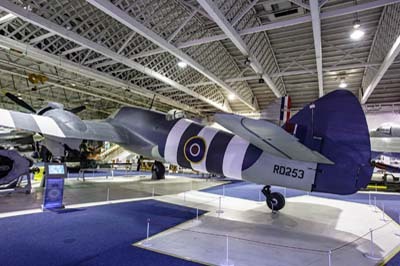 TJ138 was part of a batch of 70 Mosquito B.35s ordered in 1944 but not delivered till the latter half of 1945 when it was put in to storage with 27 MU at RAF Shawbury. In 1950 it was put in to service with 98 Squadron at Celle in Germany and later Fassberg. In 1951 it returned to storage at 38 MU Landlow to make way for the Vampire FB.5 at 98 Squadron. In 1953 it became one of 205 B.35s converted to TT.35 standard to be used as target tugs, initially at Llanbedr in 1954 and later at Woodvale from 1958. In 1959 it was put in to storage at 27 MU Shawbury. Declared to be of historical significance it was moved to 71 MU Bicester in 1959 and moved on to RAF Thorney Island in 1960. By 1967 it was at RAF Colerne where it was refurbished in 1970. With the closure of Colerne in 1975 it was moved first to RAF Finningley and then to RAF Swinderby before arriving at RAF St Athan in 1986. It was repainted in the colours of 98 Squadron in 1991 to join the RAFM Hendon in 1992. Avro Lancaster I (R5868 'PO-S' later 7325M). The Lancaster was based on the twin engine Avro Manchester and made its first flight on January 9, 1941. It employed four Rolls-Royce Merlin engines. By the time production had ended 7,377 aircraft had been built by six major companies. During the last three years of the War it was a very successful night bomber and continued in service until 1954. Today only 17 survive and of those only two are maintained in flying condition. 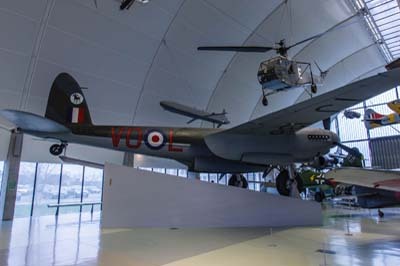 The aircraft on display was built by Metropolitan Vickers in 1942. It started its service life with 83 Squadron, before transferring to 467 Squadron RAAF. During the War Lancasters on average flew 21 missions before being lost. Little more than 20 flew over 100 missions, R5868 flew a total of 137 missions. In 1945 it went in to storage at Wroughton. By 1970 it had been refurbished at Bicester before moving to Hendon in March 1972. 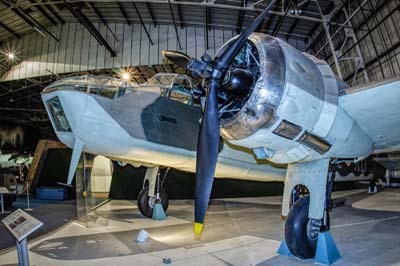 Handley Page Halifax II (W1048 'TL-S'). 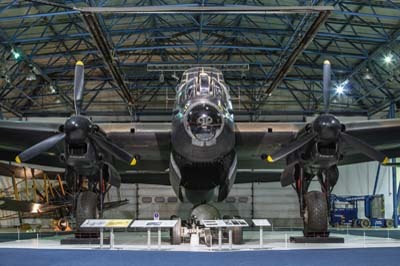 The Halifax was perhaps over-shadowed by the more famous Lancaster which also entered service in 1941. It was the first RAF bomber to fly over Germany when it took part in a raid on Hamburg in March 1941. Between 1941 and 1945 the Halifax flew over 75,000 bombing raids dropping more than a quarter of all bombs released over Germany by the RAF. Replaced as a front line bomber at the end of the war it continued its service until 1952 with Coastal Command and Transport Command. Halifax W1048 was part of a eleven aircraft raid on the German battleship Tirpitz in April 1942 by 35 Squadron based at Linton-on-Ouse. Tirpitz was reported to be in Foettenfjord in Norway. Flying from Kinloss W1048 was over the target but hit by flak and forced to make a landing on the frozen Lake Hocklingen. Five of the crew escaped to Sweden, the sixth member, due to an injured ankle, was unable to get away was taken prisoner. In 1971 the Halifax was found to be in remarkable condition at the bottom of lake. 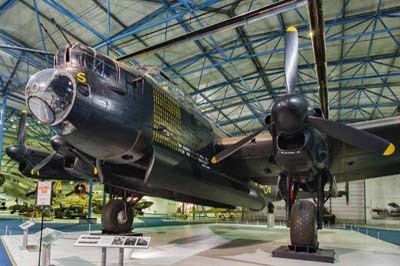 In 1973 using oil drums filled with air the Halifax was raised from the lake bottom and towed to the shore, where it was dismantled and brought back to the UK. 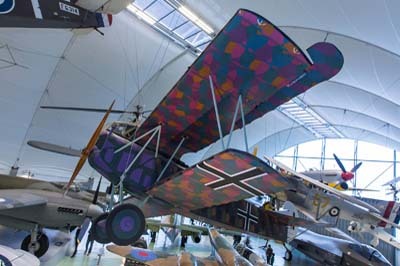 Although a full restoration was considered it was finally decided that it should be displayed as the aircraft was found.